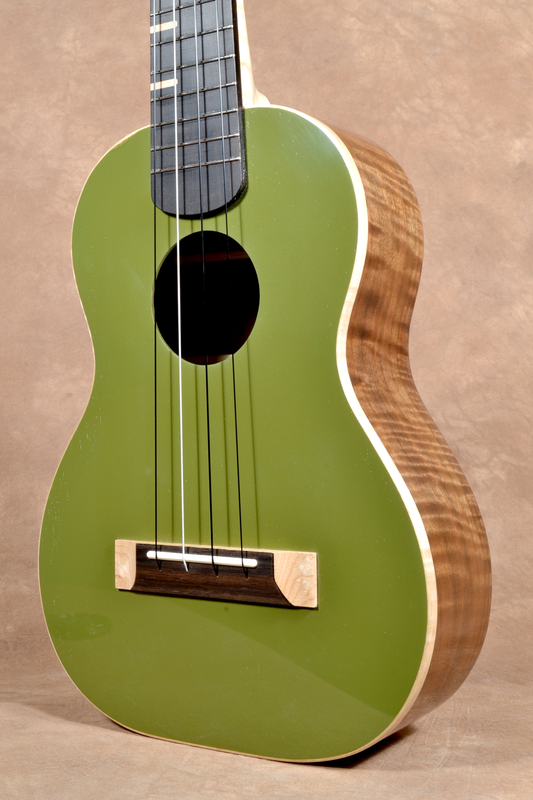 We've made this olive tinted top with walnut body uke a few times, and each time it finds a happy home rather quickly. It's a pleasant combo of color and wood, and has an intrinsic, classic, retro vibe that many artists gravitate towards. Walnut bodied instruments typically sound good but this one sounds incredibly good. 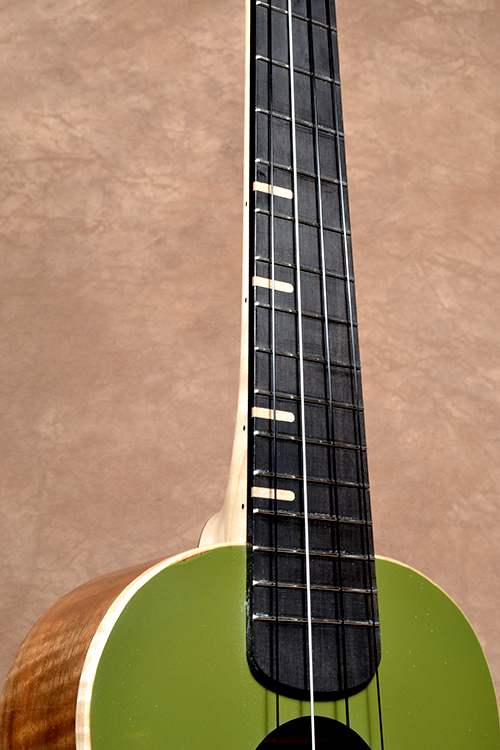 Underneath the olive tinted lacquer is a top-shelf piece of Honduran Mahogany which makes a solid soundboard that brings a nice rich and sustained tone. This ukulele is great for fingerpicking or strumming. The Walnut is California (or Claro) and is a nice curly set. It’s well aged and paired with an even more well aged Honduran Mahogany top, which is then surrounded with a curly Maple edge binding (and is identical to the wood used on the neck; quartersawn Western Big Leaf curly maple). The fretboard is a nice tight grained black Ebony, and the maple / ebony combination is also echoed on the pinless-string thru bridge. Peghed brand tuners with their planetary 4:1 gear ratio make tuning this easy. The intonation, fretwork and set up exceed excellent. The back of the instrument is slightly bowl-shaped, and the uniquely arched backs on both axis were built to increase strength and projection from the instrument. These thoughtful features make Green Olive look impressive, play well, and most importantly- feel good. The ukulele comes with a hardshell case. It is approx. 26” long and weighs about 23 ozs.